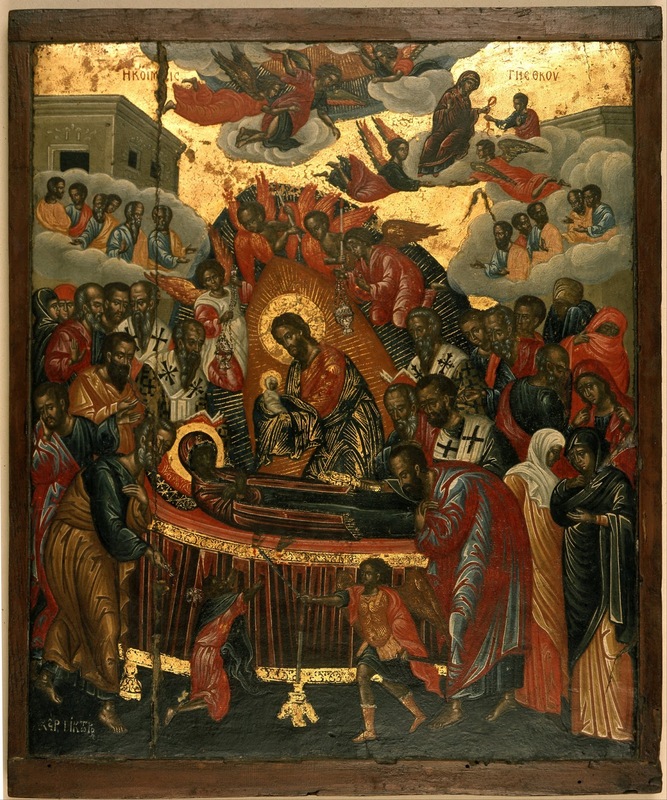 The Orthodox Church celebrates the Dormition of the Theotokos today [15 August], the same day as the Roman Catholic Feast of the Assumption, and in recent weeks it has been a privilege to watch a new icon on this important theme in Orthodoxy being shaped and created by Alexandra Kaouki (Αλεξανδρα Καουκι), perhaps the most talented and innovative iconographers in Crete today, as she worked in her studio below the Venetian fortezza in the in the old town of Rethymnon. The Dormition and the Assumption are different names for the same event, the Virgin Mary’s death departure from the earth, although the two feasts do not necessarily have an identical understanding of the event or sequence of events. The tradition of the Dormition is associated with a number of places, including Jerusalem, Ephesus and Constantinople. In his guidebook, The Holy Land, the late Jerome Murphy-O’Connor points out that two places in Jerusalem are traditionally associated with the end of the Virgin Mary’s earthly life: a monastery on Mount Zion is the traditional site of her death or falling asleep; and the basilica in the Garden of Gethsemane is said to be the site of her tomb. Since the end of the 19th century, Mereyama, 8 km east of Selçuk and Ephesus, has been venerated by many Roman Catholics as the site of Virgin Mary’s last earthly home, and it is a popular destination for tourists on day-trips from Kusadasi. It is also claimed that the Girdle of the Theotokos was enshrined in Constantinople for centuries. Since the 14th century, it has been kept in Vatopedi, the monastery where I have stayed on Mount Athos. There is no documentary evidence to support the claim sometimes made that the feast of the Dormition was observed in Jerusalem around the time of the Council of Ephesus in 431. Until the fifth century, the Church Fathers do not mention the Dormition of the Virgin. The earliest traditions about the Dormition are found in manuscripts in the late fifth century, when three distinct narrative traditions emerge describing the end of the Virgin Mary’s life. 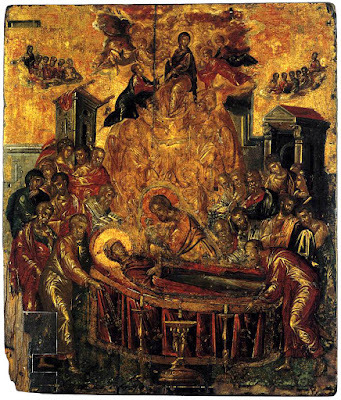 Even in the early sixth century, the Dormition was not celebrated as a holy day. According to Nikephoros Kallistos Xanthopoulos in his History of the Church, the Emperor Maurice (582-602) issued an edict that set 15 August as the date for the marking the Dormition. In a sermon on this feast day a generation later, Patriarch Modestus of Jerusalem (630-632), regretted the lack of specific information about the death of the Virgin Mary. The Byzantine tradition was adapted in Rome when Pope Sergius I (687-701) declared the feast called Dormitio Beatae Virginis. 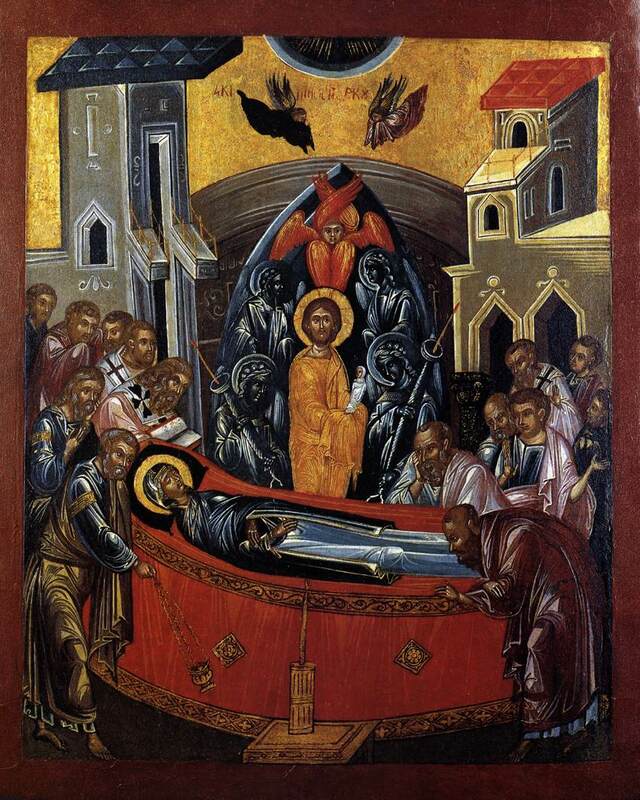 An early version of the story of the Dormition is found in ‘The Account of Saint John the Theologian of the Dormition of the Mother of God,’ a Greek text usually dated to the sixth century, although some would date it earlier. After Pentecost, according to later traditions, the Virgin Mary spent her later life supporting the early Apostolic Church, and lived in the house of Saint John the Divine in Jerusalem. There the Archangel Gabriel told her she was going to die three days later. The apostles, scattered throughout the world, are said to have been miraculously transported to be at her side when she died. Earlier traditions also say that the Virgin Mary was buried in Gethsemane, according to her request. However, Saint Thomas is said to have arrived from India three days after her death. When he saw her body in a cloud above her tomb and rising to heaven, he asked her: ‘Where are you going, O Holy One’ She took off her girdle and gave it to him, saying ‘Receive this my friend,’ and then disappeared. When the Apostles arrived with Saint Thomas at her grave, her body was gone, and an apparition is said to have confirmed that Christ had taken her body to heaven three days after her death to be reunited with her soul. 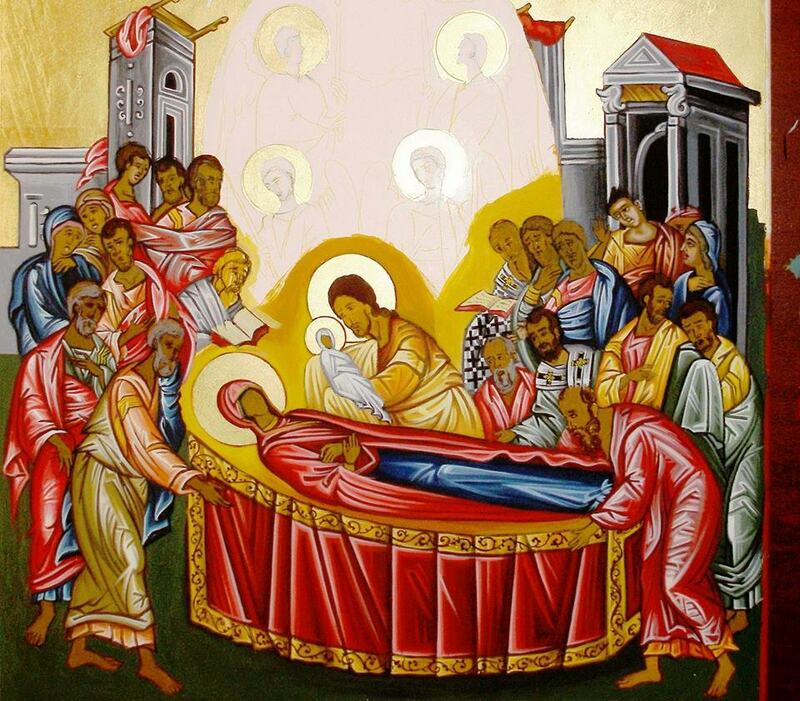 Traditional icons of the Dormition depicting the death of the Virgin Mary incorporate many apocryphal elements or details from writings known as pseudepigrapha. In the earliest of these icons in the Byzantine tradition, Christ is coming to receive the soul of his dying mother, surrounded by an aureola or cloud of blinding light and accompanied by the angels and prophets. Christ is shown in a similar cloud of light in icons of the Transfiguration, the Resurrection and the Last Judgment. In the centre, Mary is lying on a bier. In the sky above, the Apostles are arriving on clouds, and they are see too after their arrival, standing around her bier, so that they are represented twice in the icon to show two stages of time. The stories say Saint Peter arrived for her death from Rome, Saint Paul from Tiberia, Saint James from Jerusalem, and Saint Mark from Alexandria. Saint Andrew, Saint Philip, Saint Luke, Saint Simon the Cananaean, and Saint Thaddaeus who had died were raised from their tombs to be present. Only Saint Thomas was late in arriving from India. Christ stands directly above the Virgin Mary, holding his mother’s soul on his left arm. But her soul is shown wrapped in swaddling clothes as an infant because she is just born into Heaven. Above Christ is a red-winged angel of the rank of the cherubim. In traditional icons, Dionysius the Areopagite is in the lower right in the stole of a bishop. Many icons also show the Apostle Paul’s companion, Saint Timothy, and Saint Hierotheus, the first Bishop of Athens. Other icons include saints of later periods. In the clouds at the top, two angels wait on the other side of the opened doors of Heaven, their hands covered with cloths as a sign of veneration for a sacred object or person. In many icons of the Dormition, there is a strange scene just below the bier where a man has his hands reaching upward. According to tradition, he is Athonios or Jephonias, a Jew who was jealous of the honour being shown to Mary. He tries to push over the bier but is blocked by an angel – some say the Archangel Michael – severed his hands with a sword. In some icons his hands have not yet been cut off, in others his hands are severed from his arms. Tradition says Jephonias repented and with faith, was healed, joined the funeral procession, and became a Christian. The legend of Jephonias first appears in apocryphal texts in the fifth and sixth centuries. But is this an early example of anti-Semitism? Professor Elisheva Revel-Neher of the Hebrew University of Jerusalem, points out in her study of ‘The Image of the Jew in Byzantine Art,’ that the earliest known depictions of this scene are found in Cappadocia in the ninth and tenth centuries. In Orthodox theology, the conception of Christ by the Theotokos is sometimes said to be foreshadowed in the Old Testament by the Ark of the Covenant, and the procession of the body of the Theotokos by the Apostles is then seen as being foreshadowed by the Ark of the Covenant being captured by the Philistines and eventually brought to Jerusalem. The story of Jephonias has been compared with the story of how the Philistines captured the ark of God, took it to Ashdod, and placed it in Dagon’s temple, setting it beside Dagon. The next day, the people of Ashdod found Dagon had fallen on his face before the ark of the Lord. They put Dagon back in place. But the next day they found Dagon had fallen on his face on before the ark of the Lord, with his head and hands broken off and lying on the threshold (see I Samuel 5: 1-5). The best-known version is by El Greco, or Doménikos Theotokópoulos (Δομήνικος Θεοτοκόπουλος, 1541-1614), from Crete. 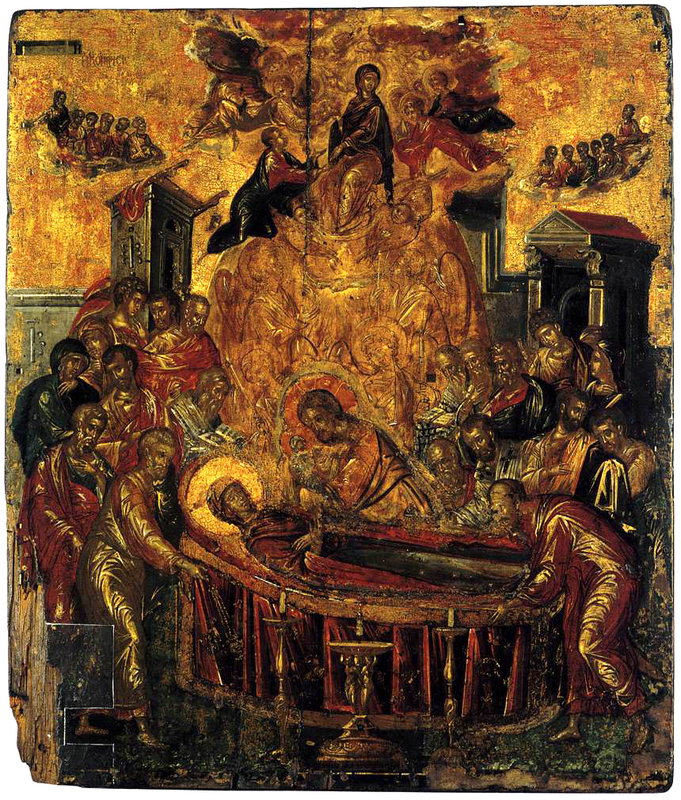 He painted his Dormition of the Virgin near the end of his Cretan period, probably before 1567. His signature on the base of the central candelabrum was found in 1983. El Greco’s interpretation combines post-Byzantine and Italian mannerist stylistic and iconographic elements. El Greco’s icon, which is now venerated in the Church of the Dormition in Syros, was probably brought to the island during the Greek War of Independence. His icon conforms closely to the established Orthodox pattern for this subject, although it has lost some elements of traditional Byzantine austerity. 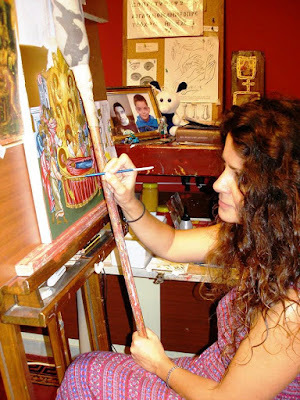 Last month when I visited her studio in Rethymnon, Alexandra Kaouki, who is one of the foremost iconographers in Crete, was completing her new icon of the Dormition of the Theotokos (Κοιμησεωσ τησ Θεοτοκου). This new icon, measuring 45 cm X 33 cm, has been created for the Church of Our Lady of the Angels (Κυρίας των Αγγέλων, Kyrias ton Angelon), or the Little Church of Our Lady (Μικρή Παναγία, Mikrí Panaghía) in the old town of Rethymnon. The Church of Our Lady of the Angels faces a small square on the corner of two of the main streets of the old town of Rethymnon, Nikifórou Foká Street and Arampatzoglou (Thessaloníkis) Street. On the night of 3 and 4 April 1917, local people claimed the miraculous discovery of an icon of the Virgin Mary on the steps of the minaret. The mosque was turned back into a church, and was dedicated to Our Lady of the Angels – to distinguish it from the Venetian cathedral, “Great Saint Mary’s.” A shrine of the icon was set up in the restored church and a new belfry was added in 1920. In her studio below the Venetian Fortezza in the old town of Rethymnon, we discussed why El Greco places three candelabra in front of the bier. Perhaps he is using then as a Trinitarian symbol. However, Alexandra has returned to the traditional depiction of only one to remain true to Byzantine traditions. How many of the Twelve should be depicted? Should Saint Thomas be shown as being present? She also decided to omit the story of Jephonias, not because it is gruesome but because it is a later development in the tradition. On the other hand, she has included some of the woman we might imagine were present at the Dormition. 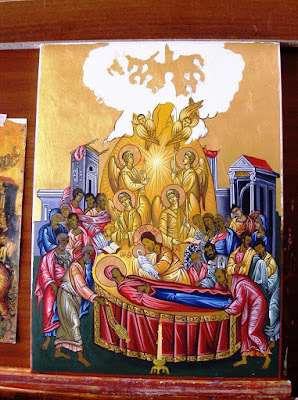 Alexandra has posted photographs of this work on her Facebook page as her work has progressed, and it was completed at the end of last week in time for today’s Feast of the Dormition. ● Since 2011, the Abbot of the Benedictine Abbey of the Dormition in Jerusalem has been Abbot Gregory Collins. He was born in Belfast in 1960 and was a monk Glenstal Abbey before going to Jerusalem. His books include The Glenstal Book of Icons (2002).